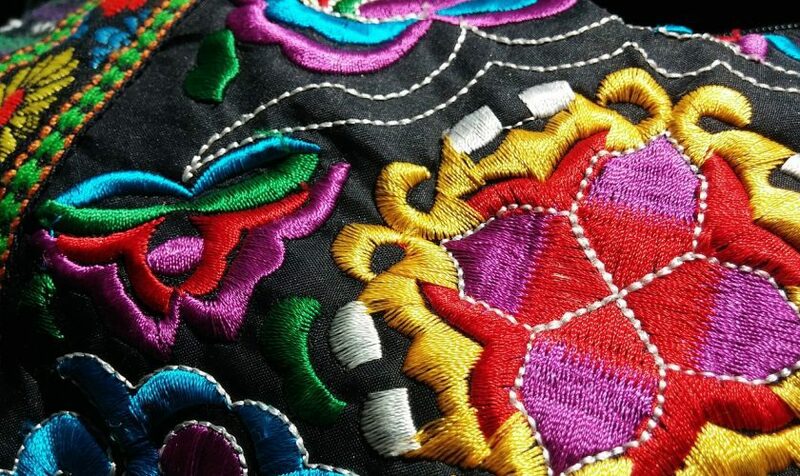 Whether you do it by hand or with a machine, embroidery is a rewarding craft. It’s inexpensive to get started, and it’s fun to bring design ideas to life. With embroidery, you can be as colorful and as witty as you want. Hand embroidery patterns can range from repeating motifs to beautifully illustrated scenes and script-style text. They can be as complex or as simple as you want. While you’ll find plenty of patterns for sale on sites like Etsy, you can also find free patterns – many of which have fun, modern designs. Many of these designs also have free embroidery patterns instructions, so even beginners can tackle them. A free pattern from DMC, this design features the quote “Life is tough, but so are you.” The words, which are a mix of script and print lettering, are surrounded by a pretty floral design, which is a mix of leaves and flowers. The sample pattern features pink, blue, yellow and red colors, but you can choose any palette you please. This design is a little more complex and will take you at least ten hours to complete, but it looks great on totes, sweatshirts and pillows. If you’re looking for motivational embroidery designs, this one from DMC is another great choice. The pattern features the words “make it happen” enveloped in a floral pattern of leaves and flowers. The sample design features purple, lavender, blue and yellow colors, but would look equally as beautiful with pastels or a darker color palette. Add this pattern to your gym or work bag for a little extra motivation on those tough mornings. A pretty pattern with a good message. Offered by Down Grapevine Lane, this design features the words “Love without reason” in a pretty script font. The quote is centered inside a ring of flowers and leaves, with floral accents on the first and second lines. The sample pattern features a rainbow of colors, including blue, red, green, yellow, orange and pink. The background is a simple beige with subtle white polka dots. The design has a retro feel and would look beautiful hanging on the wall. If you’re looking for machine embroidery patterns, this one from EmbroideryDesigns.com is a cute choice. This design is one of hundreds of free embroidery patterns offered on the site. The design features the words “Love is a wet nose and a wagging tail,” with a paw print as the “o” in “love.” The pattern also features an adorable dog snout and wagging tail. Designed for machine embroidery, this is one pattern you cannot do by hand – it’s too complex. But it would look great on a sweatshirt or a pillow in a dog-lover’s home. An adorable pattern from Flamingo Toes, this design features a retro floral background and four simple elements: a speech bubble, the words ”Hello Sunshine,” and two hedgehogs. This is a simple pattern that doesn’t have a whole lot of stitch work. But the fun typography and cute animals make it a great décor piece. It’s a great pattern for on-the-road crafting. Offered by Bakercourt, this design features the words “life is beautiful.” The stitching for the letters incorporate elements of nature to give this simple design a complex feel. The letter “u” in beautiful consists of a string of flowers, while a daisy wraps around the “l.” The “i” features a pink coil with a beautiful butterfly as the dot. From dragonflies to bees and flowers, this design celebrates all of the beautiful things in nature. The colors in the sample design are wonderful, but you can use whichever colors you prefer. Natural hues work best for this pattern. If you’re a traveler at heart, you’ll love this retro-style design offered by Flaming Toes. The artist added pink pom poms around the perimeter of the hoop to really make this design pop. In the center of the hoop is a retro camper, with different fabrics used for the top and bottom of the camper. The same retro fabric is used for the door and window, while a polka dot pattern is featured on the wheels. A fun string of flags is hung across the top of the camper. The words “get out of town” are carefully stitched below the door of the camper. This is such a fun retro pattern that’s so easy to complete. Step-by-step instructions are given, and the stitching is freestyle. This simple pattern from Swoodson Says is great for beginners. The design features the text “the days are long but the years are short,” with a leaf motif on the top and bottom. The same pattern uses black for the text and green for the leaves, which are a simple outline. You can make this design as simple or as complicated as you want. Fill in the leaves, or keep it as an outline for a more modern look. The message is a great one, and this hoop would look great hanging on the wall in an office or living room. Bright, bold and busy, this pattern from Wild Olive will keep you focused. The sample colors and fabrics are wonderful. The bright blue background features a white paisley pattern, while the text “don’t be distracted” and its accent designs are bright and bold. Yellows, oranges and reds bring the text to life. Of course, you’re free to make this design a little less “distracting” by using subtler colors and a solid fabric for the background. A free pattern from Tuts Plus, Totes Awesome is designed for – you guessed it – totes. The text “Totes Awesome” is written in a bold font atop a banner. The design also features a ship’s wheel, rope, stars and a flower. The nautical theme of the pattern makes it a great addition to any beach bag tote. Tuts Plus provides detailed instructions on how to embroider this design onto your bag, from transferring the pattern to stitching. They even have instructions for finishing the tote and preserving the design. Show off your love for ice cream with this free ice cream cone mandala pattern from The Spruce Crafts. The design features a circle of ice cream cones, sprinkles and cherries. This pattern is great for summer tote bags and t-shirts, but it would also make an adorable framed hoop piece. Simple yet adorable, this design would make great wall art or a framed hoop piece. The pots and cacti are both simple outlines, so the pattern is very beginner-friendly. There are no complicated stitches or shapes with this one. Just print the design, transfer, get stitching, and enjoy. These are some of our favorite designs, but you’ll find hundreds online and from a wide range of sources. Start with something simple if you’re a beginner, and then work your way up to complicated patterns or patterns that you have to purchase.